The proliferation of mobile devices has placed a greater emphasis on the need for strong WiFi performance in the modern home. In recent months, the move to increase performance, stability and range has been driven by the launch of a new wave of high-end routers powered by the latest-generation 802.11ac wireless networking standard. We had our first taste of Wireless AC performance from Netgear's D6300, but that router's boast of theoretical WiFi speeds of up to 1,300Mbps has already been trumped by Asus and a couple of other manufacturers, whose latest offerings tout trend-setting speeds of up to 1,900Mbps. 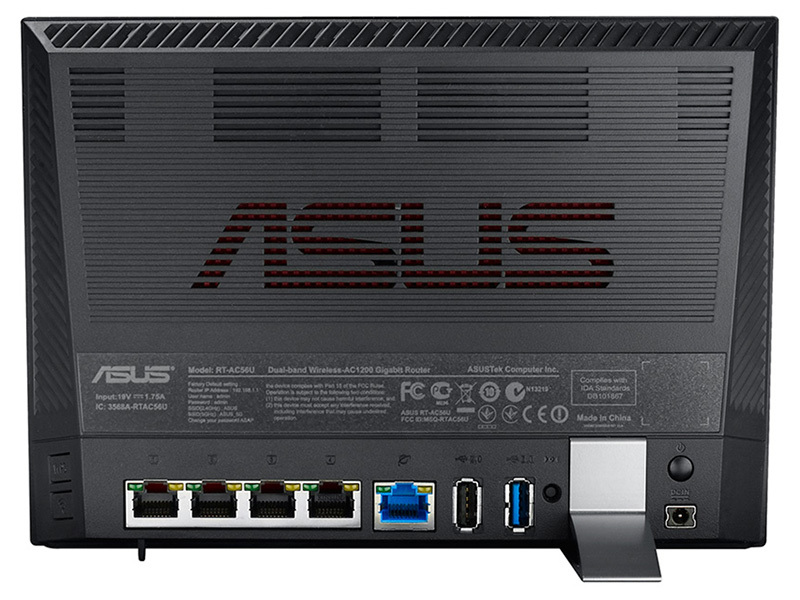 The numbers are spectacular, and if our previous experiences with Asus routers are anything to go by, the new range should be well suited to enthusiast users who want to revamp their home network experience. The first router under the microscope is the RT-AC56U, priced at £130. And here's an early warning for those seeking a bargain; this is the cheaper of the two devices on show today. 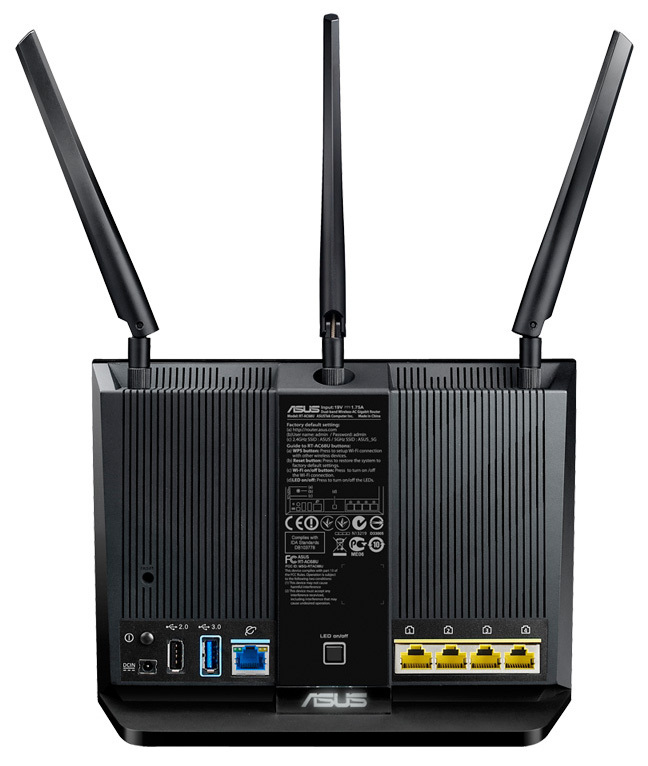 High-end routers based on the new WiFi standard typically carry a price premium, and the RT-AC56U aims to justify the cost by employing a dual-core ARM Cortex processor and 256MB of RAM - a partnership that makes this one of the most powerful AC routers to date. Maintaining the design ethos of its predecessors, the router's front fascia sports a mock carbon-fibre weave that gives it a premium look and feel. 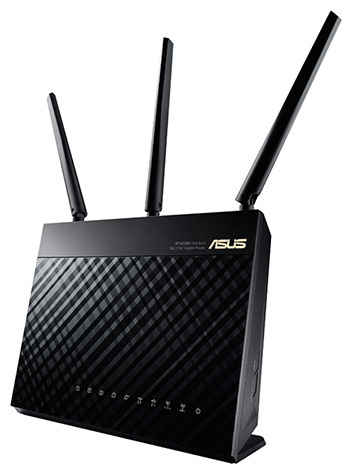 Standing at 147mm x 205mm x 66mm in size and weighing a reasonable 406g, the router isn't too bulky, feels well put together, and, as a result of built-in antennae, is essentially a set-and-forget solution. The front carries a series of LEDs for at-a-glance status updates, but it's around back that the bulk of the activity takes place. Asus provides a quartet of Gigabit Ethernet ports, alongside a WAN port for connecting your existing broadband equipment. 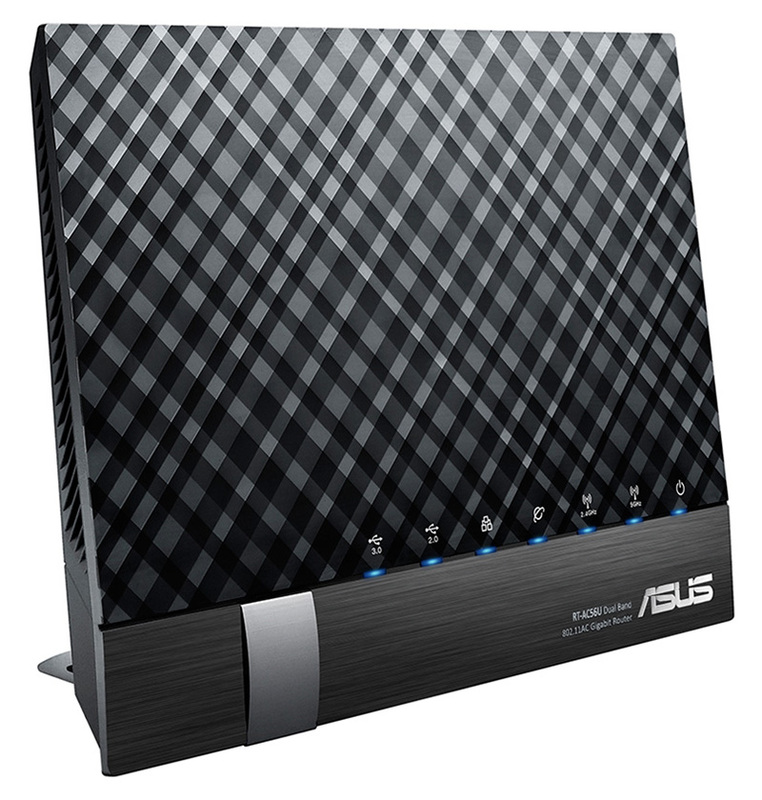 Asus doesn't provide a model with an integrated modem, so remember this is a router-only solution and you'll need to rely on your own cable/fibre modem to bring an Internet connection into the network. Elsewhere, we have dual USB ports - once of which has finally been upgraded to the SuperSpeed 3.0 variety, and both of which can be used to charge peripherals - as well as a connector for the bundled power cable, a dedicated on/off switch and a small metallic stand. Around the side are two easy-to-reach buttons; the first a WPS one-click connection establisher; the second a toggle switch used to turn all wireless radios on or off. 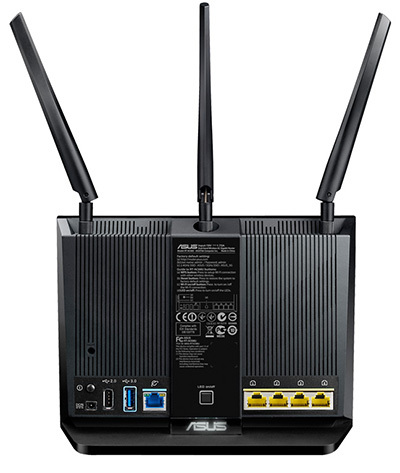 Launched as "the world's fastest WiFi router," the RT-AC68U promises combined dual-band data rates of up to 1,900Mbps. This is one of the first of a new breed of super-fast Wireless AC solutions, so how does Asus go about delivering such lofty speeds? Well, there are a couple of tricks up the RT-AC68U's sleeves. Firstly, there's a 3x3 antenna array, allowing the router to achieve 1,300Mbps on the 5GHz band, but it's the quoted speed of 600Mbps on the 2.4GHz band that's just as intriguing. In order to achieve the performance boost on the ageing 2.4GHz band, Asus has employed a new Broadcom technology dubbed TurboQAM. What this means is that instead of using the traditional format of an 802.11n transceiver for the 2.4GHz band and an 802.11ac transceiver for the 5GHz band, the RT-AC68U uses a pair of 802.11ac transceivers - in this case Broadcom BCM4360s - for both bands. Taking advantage of the high-density modulation available to the transceiver, the router is able to deliver data rates of up to 600Mbps over the 2.4GHz band on a 40MHz channel. Maximum speed and future-proofing is clearly the goal, but while the RT-AC68U comes armed with the same CPU and memory as the lesser RT-AC56U, the use of dual 802.11ac transceivers and a 3x3 antenna array does have an impact on size and cost. The top-of-the-range RT-AC68U is heading to UK shores with a considerable £190 price tag, and the router itself measures 220mm x 160mm x 83mm in size and tips the scales at 640g. Factor in the three protruding antennae and you have a router that's noticeably less subtle. Still, the performance advantage sounds useful, and wouldn't it be great to utilise extra performance on the ubiquitous 2.4GHz band? Well, yes, but in this case there is a rather large proviso: in order to achieve the advertised speeds of up to 600Mbps, you'll need TurboQAM technology on both the router and the client. 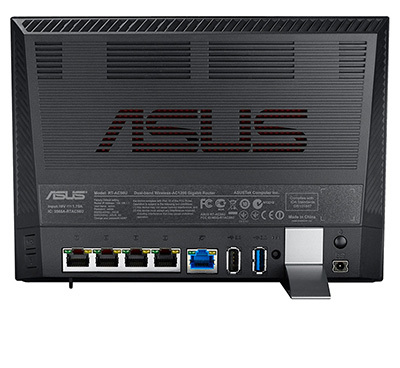 At the time of writing, we can't think of a single mobile device with TurboQAM baked in, and as far as we can tell, the only way to take advantage of this extra performance headroom today is to use Asus's own dual-band PCE-AC68 PCIe adaptor, which will set you back a further £70. The RT-AC68U is a serious investment and ideally suited to enthusiast users, but if that sounds like you, the feature set should fit the bill. Four Gigabit Ethernet ports adorn the back of the device, alongside WAN, dual USB ports (both with charging functionality, one with SuperSpeed 3.0 capability), a dedicated power button, and an on/off switch for the front status LEDs. In keeping with the smaller RT-AC56U, WPS and WiFi toggle buttons are positioned along the left edge.